Home MMA News Jacare Souza Defeats Chris Weidman Via Third-Round KO! 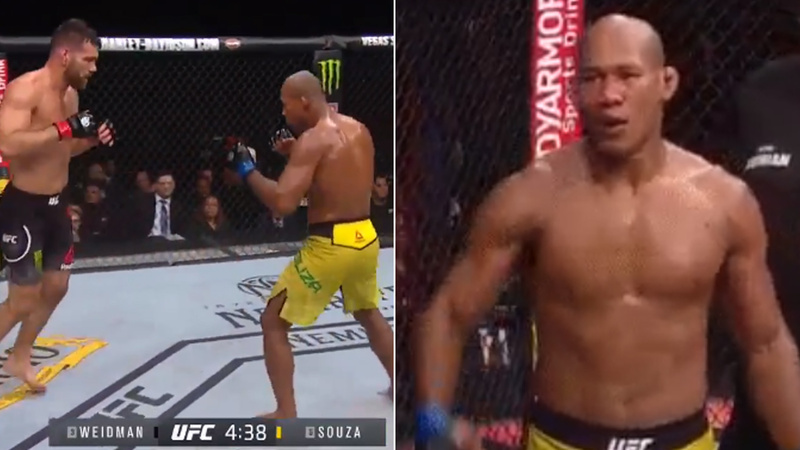 Jacare Souza Knocked Chris Weidman Out Via Brutal Right Hand! We’re live inside Madison Square Garden in New York, New York, where Ronaldo “Jacare” Souza fights Chris Weidman at the co-main event of UFC 230. Dan Miragliotta is the third man in the octagon. Fighters touch gloves. Jacare Souza controls the middle, making pressure. Good left right hand Weidman. Low kick Souza. Overhand miss Souza. Weidman with a good left hook, Souza returns with a right hook. Jacare keeps pressing him, and great clinch knee from Weidman, the fighters separate. Jacare misses with a kick. Good right hand by Souza, but Weidman slips. Good exchange. Excellent right hand by “All American” Souza felt that. Again good right hand. Fighters trade shots again. Souza with a great left uppercut to the liver, two times in a row. Right low kick Souza. Souza misses with a right hand. Good exchange. Jacare Souza with a right low kick. Souza misses a right low kick. Weidman uses left hand to control the space and misses with an overhand right. Good punches from Weidman but Souza slips. Good left hand Souza and connects with a right low kick. Front kick Weidman. Souza with a great left uppercut to the body. Excellent knee Souza. Souza is bleeding, good left hand by Weidman. Souza moves around the Octagon and the round is over. Tough round to score. Fighters touch gloves again, low kick Jacare Souza, Weidman with left and right, ends up with a low kick. What an exchange now! Right low kick Chris. Low kick Souza. Good jab “The All-American”. Awesome punch to the body from Weidman, good clinching, knee Souza, left hand from Weidman. What an exchange! Souza connects and misses with a hook to the body. Souza misses a lot but goes forward. Good right hand. Fighters are in the clinch trading knees. Knee Souza and fighters separate. Right hand from hell Weidman! Souza misses right hand and knee. Good right, hand Souza. Overhand right Souza. Weidman with a solid body kick. Souza bleeds more. Awesome right hand Souza, and connects with a few to the body. Overhand right misses Souza. Weidman attacks with a right hand to the body. Good right hand from Chris. Jab Weidman, Jacare slips. Weidman blocks left middle kick. Souza tried the high kick, but he went down, Weidman pushes him against the cage. Weidman takes “Jacare” down off his back. But Souza with a tremendous counter. Weidman stands up. What a match, almost impossible to score! Amazing round! Fighters touch gloves again. Souza with a low kick. Good left body kick Weidman. Souza with a left uppercut to the liver. Good right hand Souza, fighters are trading shots! Souza misses but goes forward. Souza blocks shots. What a right knee Weidman. Fighters in the clinch again. Again separation, right hand Jacare Souza, uppercut and elbow Weidman. Is Jacare in trouble? No, he returns with a right front kick. Right straight punch Souza. Middle kick Souza. Good 1-2 Weidman. Ronaldo with an amazing combo. It was 4-5 punches! Great punch Souza. What a right hand by Souza and Weidman goes down! Souza stopped, is Dan Miragliotta going to stop the match? Weidman grabs the leg, Jacare Souza delivers few more strikes. Yes, the referee stops it! The fight is over! Ronaldo Souza improves the score to 26-6-1 MMA, 9-3 UFC, while Chris Weidman drops to 14-4 MMA, 10-4 UFC. Next articleDaniel Cormier Defeats Derrick Lewis Via Rear-Naked Choke!